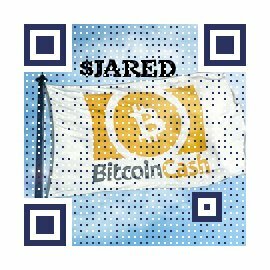 Bitcoin Cash, BCH, is a cryptocurrency and a variant of Bitcoin Classic, BTC. It forked off from BTC the 1st of August in 2017. BCH is similar to BTC. It was created as a means to offset perceived shortcomings of BTC, namely, the 1 megabyte block size. Bitcoin Cash, at the time of the fork, had a block size of 8 MB and that size has now increased to 32 megabytes. Bitcoin Cash also incorporates an emergency difficulty adjustment algorithm that corrects for difficulty more rapidly than BTC. Upon block 478558, anyone possessing BTC automatically inherited BCH. BCH transactions can be confirmed on the order of minutes, whereas BTC can require days. The cost to undertake a transaction is a fraction of a dollar. As of July 7, 2018, the transaction fee for BTC was 64 cents. BCH to fiat currency conversions by merchants incur lower costs than for credit card use. BCH Transaction fees have not exceeded 20 cents USD since February 2018. The motivation to develop BCH stemmed from the perception that BTC had become costly and unreliable to utilize. The creators of Bitcoin Cash blamed this problem on a failure by the Bitcoin Classic community to decide what was a good policy regarding the size of network capacity. The creators of BCH felt some members of the Bitcoin community had a view of the network in conflict with that of Satoshi Nakamoto. They regard these deficiencies in the network as the motivation for a profound drop in crypto market share, as much as 55%, by BTC. The problem was that BTC blocks were given a ceiling of 1 MB, which some felt hurt processing speeds. Originally a measure to defend against spam, as block size grew, there was a fear that because of this feature, blocksize might one day become on par with this limit, causing processing to take longer. It is hoped that transactions using the methodology in Bitcoin Cash will allow transaction volumes that are competitive with credit cards. Visa, for example, has a mean per second processing rate of 1,700 transactions. The BTC network required an average of 20.07 minutes per block for the 7 days between July 1 and July 7, 2018 and processed roughly 2 transactions per second, on average, over that same period, a small fraction of 1700. As of July 7, 2018, the 7 day average for BCH block confirmation time is 9.9 minutes. And the average transaction rate for that same period was .5 transactions per minute. In addition, more flexible difficulty control as currently implemented means the difficulty level is less influenced by how many miners there are, one goal being to stabilize processing times. Segregated witness is not included in the fork, as it was for BTC, meaning signature information remains inside the block. In BTC, as much as 65% of data comprises this subset in a given block. Drawbacks: There is concern among BTC users that BCH's larger block necessitates more powerful computer processing, lending a dangerous advantage to a minority of corporations and excluding miners with fewer resources. Difficulty control that is less affected by the number of miners could have security implications. Coinbase is one exchange for convenient conversion from USD to BCH. Kraken is useful for converting from EUR to BCH. BCH Price correlation to BTC price is .85 for the 90 days ending on Aug 2nd with a P-Value of less than .005, .05 and below being the metric frequently used in academic research to define statistical significance. Between May 29th and Aug 1st, the log return Pearson correlation between BCH and BTC grew. On May 29th, it was .753. Its correlation with Ripple also increased until July 26th, .79 at the start of this interval, though from Jun 26 to July 8th, that increase stagnated, after which, they both increased dramatically. After the 26th of July however, that increase began to reverse. 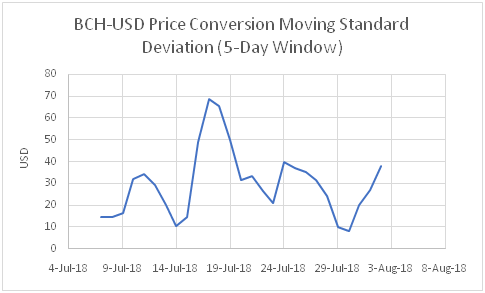 BCH price daily standard deviation from July 3rd to close on August 2nd was 50.07 USD. The strongest non-crypto correlation is with VIX, at .17. The correlation with GLD is -.05, and -.03 and -.1 with TNX and SPX respectively. Ether has a P-Value of .6 with GLD. SC's P-Value with GLD is .78. The decline in Bitcoin Cash price from early May continues. This decline has been closely mirrored by the Market Capitalization for the full duration of this interval. Over the shorter-term period of the last month, this correlation is still evident visually, suggesting the two parameters are responding to the same signal.